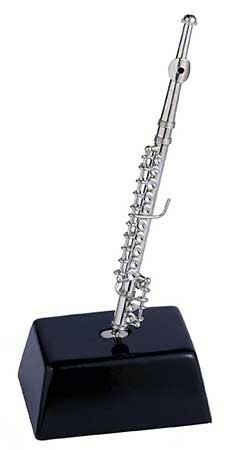 Miniature Flute on Stand – The Miniature Flute on Stand is a thoughtful gift idea for anyone who plays the flute. Beautifully crafted, this replica has immaculate detail! A cool decor piece that can show a flutists’ passion for music! The figurine comes with a sturdy black lacquered base and felt bottom for security. Made of brass. Approx. 5″. Music Gifts for Flute Players!